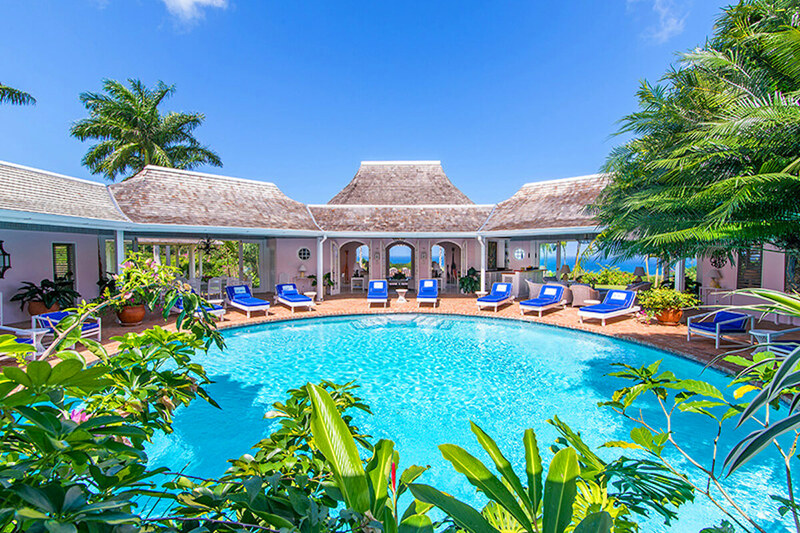 The Tryall Club is home to many beautiful villas but Ma’ Moura Villa is an exceptional choice for those who want a carefree and luxurious Caribbean vacation. The house is located on beautifully landscaped grounds all built around a circular pool. The four bedrooms and four baths are each spacious with a twist of green and blue decor to give that true island feel. Another nice feature is that each guest can walk out of their bedrooms to the centrally located pool for lots of family and friend time. The pool has plenty of cushioned lounge chairs for soaking in the sun. You may want to eat dinner on the patio overlooking the ocean at a table set for ten. The best part about dinner isn’t just the view but the fact that someone else is cooking and cleaning up as this villa comes with a fantastic staff of five. When the day is winding down, you can kick back and relax in the living area surrounded by open air archways that allow that cool ocean breeze to roll on in. Make sure to order the house drink specialty, the “Engine runner,” to truly finish off your day in style. Built and owned by the same family for over forty years, Ma’Moura’s unique setting comprised of four lots, sits high on a hill overlooking the 17th green and the Caribbean Sea. Enjoying cool breezes and unobstructed views, this villa provides one of the most private yet outdoor experiences at Tryall. Cared for by an award- winning staff of five who dedicate themselves to fulfilling your every need, Ma’Moura boasts repeat guests year after year. Upon arrival, guests are welcomed with warm smiles, a cool towel and an “Engine Runner”, the house drink. Ma’Moura is for guests who want an authentic, “unfussy” villa in an unforgettable setting with an uncompromising staff. Surrounding the circular swimming pool are Ma’Moura’s bedrooms, dining area, sitting area, kitchen and bar. Each bedroom is air-conditioned with safe and flat screen TV as well as ensuite bathroom. The master bedroom has a four-poster king-sized bed with a newly renovated marble bath and shower. Another guest room has a king size bed and another has 2 four-poster queen size beds. The fourth bedroom has 2 twin size beds that can be converted into a king, if desired. Ma’ Moura is pleased to provide its guests with free wireless internet, a comprehensive audio system throughout and the use of two complimentary golf carts. Your professional, welcoming staff is comprised of a superb team of butler, cook, housekeeper, laundress and gardener. Ma’Moura is offering a 2 or 3 bedroom rental for the Summer only. Contact your WhereToStay.com representative for more information. Short golf cart ride to the white sandy beach of the Tryall Club. Government Tax; Free shuttle service to nearby Tryall club locations, use of two, four-seater golf cars and dedicated 24-hour staff.